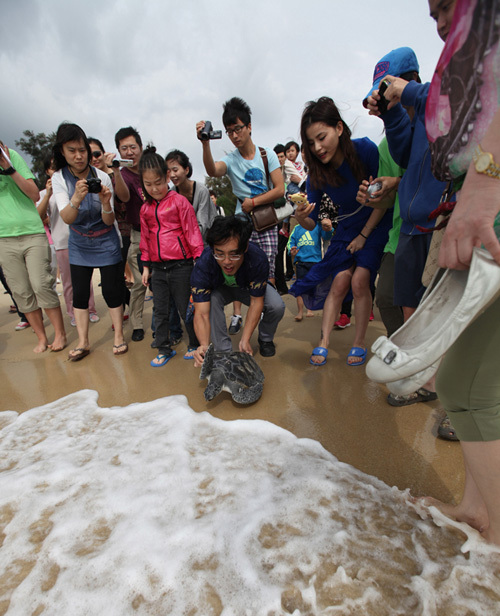 Sea Turtles 911, a non-profit sea turtle conservation organization, in the successful tagging and release of an endangered Green sea turtle ( Chelonia mydas ) from the Ritz-Carlton beach in Sanya, on Hainan Island in China. 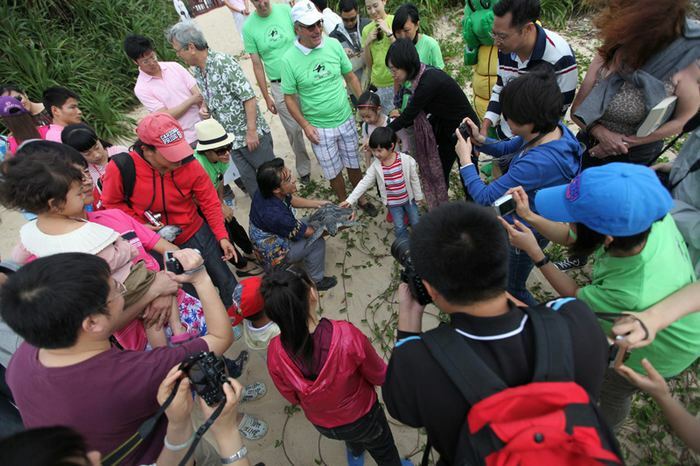 On February 18th, 2012, George Balazs of the International Union for the Conservation of Nature (IUCN) joined Sea Turtles 911, a non-profit sea turtle conservation organization, in the successful tagging and release of an endangered Green sea turtle ( Chelonia mydas ) from the Ritz-Carlton beach in Sanya, on Hainan Island in China. Many excited onlookers gathered to watch the release, including government officials, students, children, and tourists. 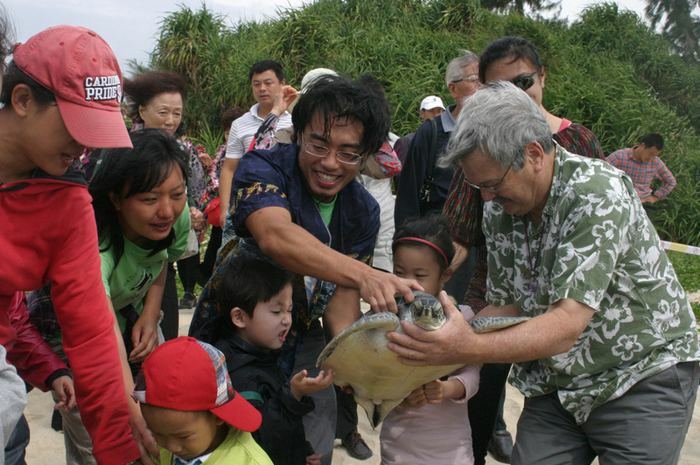 Frederick Yeh, Founding Director of Sea Turtles 911, joined George Balazs in giving a sea turtle biology and conservation presentation to the assembled crowd prior to the joyous occasion. Many excited onlookers gathered to watch the release, including government officials, students, children, and tourists. The Ritz-Carlton continued their support of Sea Turtles 911 by providing the idyllic setting for the release. Opening the event was Michel Goget, General Manager of the Ritz-Carlton, who presented the non-profit organization with a generous donation that will go towards the rescue and rehabilitation of more sea turtles on Hainan Island, and the public education of environmental conservation in China. The Green sea turtle, named ‘Crush’ by volunteers, had been rescued from a local fishing village that is home to many sea turtle poachers. Despite the endangered status of sea turtles, there remains a thriving illegal market for sea turtle meat and products in China. Frederick Yeh displayed a sample of turtle shell jewelry alongside a rescued hawksbill sea turtle, appealing to the public to help save sea turtles by boycotting turtle products, emphasizing Yao Ming’s famous quote, "When the buying stops, the killing can too." 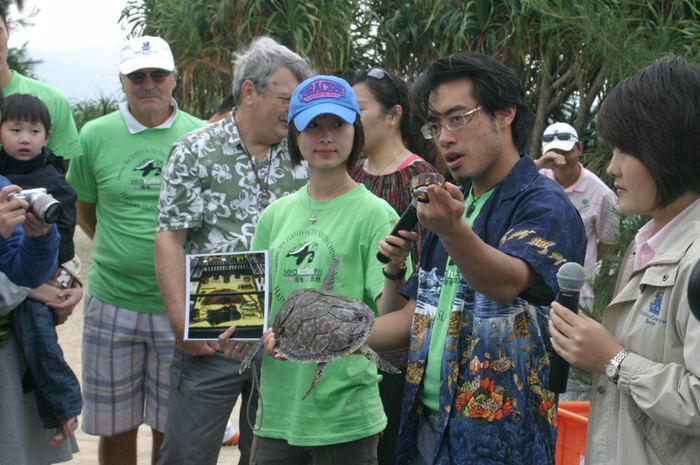 Frederick Yeh, Founding Director of Sea Turtles 911, displayed a sample of turtle shell jewelry alongside a rescued hawksbill sea turtle, appealing to the public to help save sea turtles by boycotting turtle products. The sea turtle Crush was outfitted with a metal flipper tag before his release. This tag will help with future identification and research purposes should he be recaptured by fishermen; it will be known that he was a previously caught and released turtle. It is hoped that if caught by a fisherman, his status as a research turtle would be respected, and he would be released rather than sold in the market. George Balazs described the time several decades ago when sea turtles in his home location of Hawaii were under the same threat of extinction as turtles are currently in China. After years of effort and increased protection they are now thriving in Hawaiian waters. Sea Turtles 911 envisions that one day, sea turtles in China will be restored in the same way. Also in attendance to bid their friend farewell were two resident Green sea turtles of the Ritz-Carlton, Nemo and Squirt. Sea Turtles 911 rescued Nemo after he became entangled in discarded fishing line in the ocean, requiring an emergency amputation of his right front flipper. Fortunately his “lucky” left flipper is healthy, allowing Nemo to remain a strong swimmer. Squirt is a baby sea turtle hatchling living at the Ritz-Carlton Kids Club as part of the Sea Turtles 911 head-start and educational program for children. All guests can meet Nemo and Squirt up close and personal to hear their stories, and become aware of the poaching and pollution problems that sea turtles face in China. Sea Turtles 911 rescues sea turtles, rehabilitates them, and then releases them back into the ocean, in an effort to keep these ecologically important creatures from extinction. They also provide community education and ecotourism programs to benefit local economies and create an awareness of sea turtle issues locally and nationally.